Burlington International Airport is a joint-use civil-military airport serving the northwest Vermont area. The airport sits on 942 acres and has 87 total based aircraft: fifty single-engine, four multi-engine, four jets, one helicopter, and 28 military aircraft. The ATC tower is open 19-hours per day and is staffed by FAA controllers. 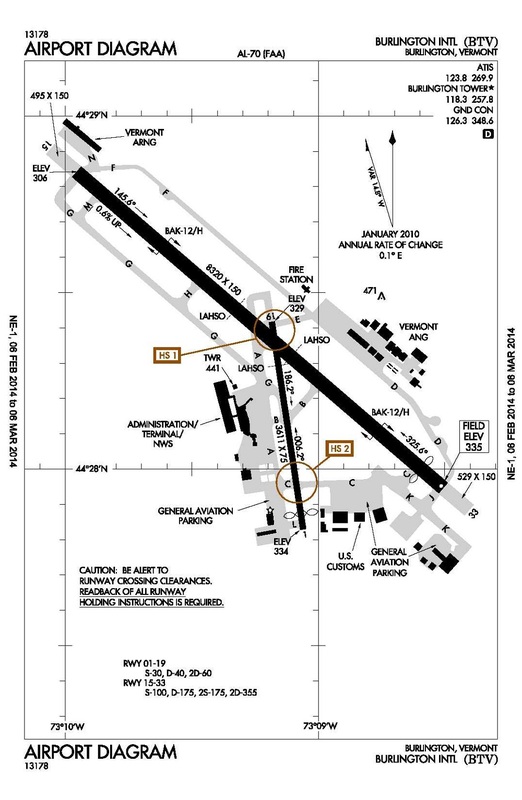 There are two runways: a primary Runway 15/33 measuring 8,300′ x 150′, and a secondary Runway 01/19 measuring 3,600′ x 75′. There are two National Guard military units on the airport including a fighter wing and a support facility. Airline service is generally limited to regional/feeder flights for Delta, United and JetBlue. The feeders connect to Atlanta (seasonally), Chicago, Detroit, Cleveland, Washington, Philadelphia, and New York City. Airport operations average 193 per day (thus, five takeoffs per ATC hour). Traffic mix includes 35% commercial and 34% local pattern. The operational trend is downward; 2012 traffic declined 19% since 2007, declined 34% since 2000, and declined 46% since 1990. FAA compiles ATADS data for this facility. Airport operations in 2012 were DOWN 19% vs. 2007 operations, and DOWN 46% from the peak year (1990). — Average AIP Subsidy is $181 per operation. …Fitch Ratings assigned a BBB rating to the airport’s $37M in outstanding revenue bonds. Their outlook was ‘negative’, citing the airport’s over reliance on passenger facility charges and parking revenue, competition from other airports and heavy reliance on Canadian travelers. However, the bonds remain investment grade. …The 2009 bond measure was narrowly defeated by voters, so a new proposal was created: a smaller parking garage with 600 spaces would be added, requiring a $21.5M bond approval. “The revenues from the parking garage will pay for that bond. The city of Burlington voters and residents will not have to be financially responsible for re-paying that bond. So it’s kind of a no-brainer,” says Brad Worthen, Community Facilitator at the airport. …A $45M bond measure will go to the voters. The airport currently has a 2,000 space parking structure; they want to add 1,400 more spaces.